It’s spring here in Earth’s northern hemisphere – and on Saturn’s cloudy moon Titan as well! This image, taken by Cassini in October of last year, shows bright clouds covering part of the moon’s equatorial and southern regions. These clouds were not always visible…in fact, they formed relatively quickly as Saturn and its moons moved into their spring season (Saturn’s vernal equinox occurred on August 11, 2009.) 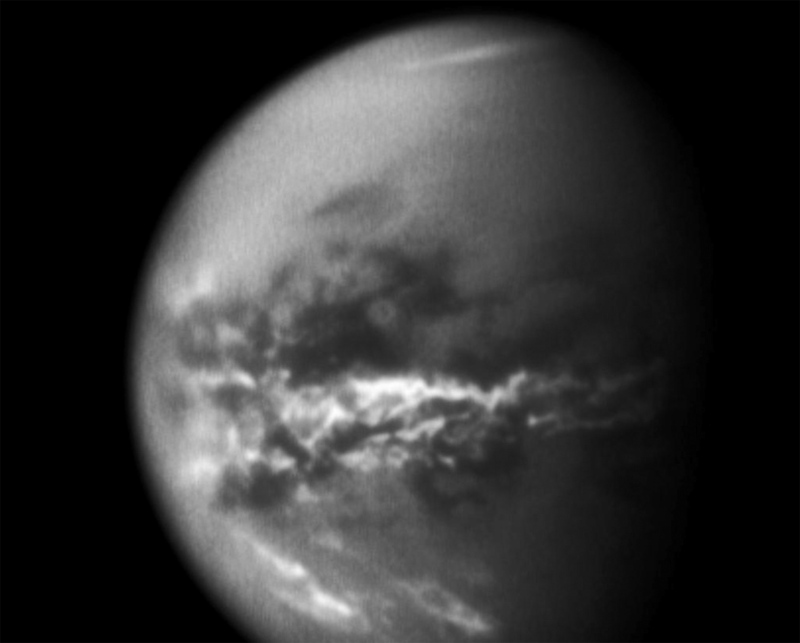 The interesting part is that as the clouds formed, the surface of Titan was seen to darken in equatorial desert areas…a sure sign of albedo reduction due to precipitation! This is the first time seasonal surface changes have been witnessed directly on Titan – in essence, we are seeing weather on another world! The temperatures on Titan are so cold – in the minus 300º F’s – that methane is the operating liquid in its hydrologic cycle rather than water. Methane falls in large, slow-moving drops from methane clouds, filling rivers and streams that eventually flow into wide, frigid and apparently very smooth methane lakes. Water, on the other hand, is frozen harder than rock and comprises some of the surface material, and in some instances may even ooze out of “cryo-volcanoes” as a thick slush mixed with organic compounds and ammonia! Yet despite its extremely cold temperatures, scientists look to Titan today as an example of what the early Earth may have been like billions of years ago. 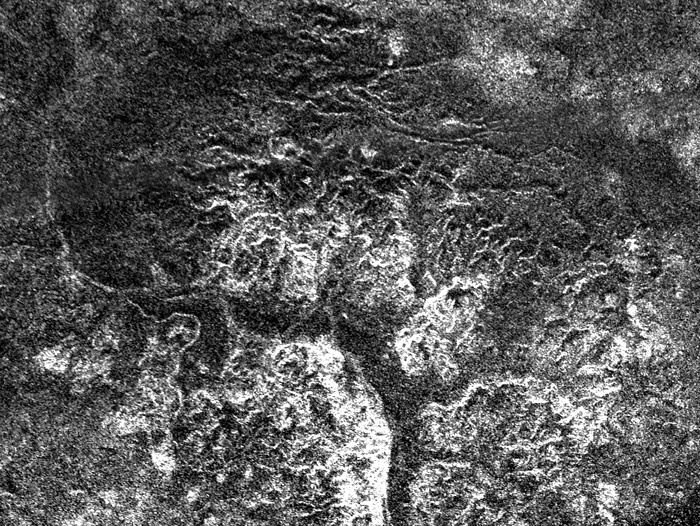 And who knows…with all those liquid organics on its surface, who’s to say if some form of exotic life hasn’t evolved to exist in Titan’s dark, cold lakes? We are just now witnessing the effects of its all-too-Earthlike weather…we still have much to learn about this intriguing moon. Read more about this news on the Cassini mission site.